I'd definitely be in for a Phil Wilson design fillet knife with thin stock. S110V, CPM154, S90V, VG10, M390 or most any "good" stainless. I came to Spyderco for the folders. My fixed-blades needs were pretty much satisfied before I came here. But, I do have a place for Lance’s WaterWay. It will do good things in places my other FBs would not survive without time-consuming maintenance. I'm not sure how such a sheath could work unless you used a static line attached to a belt loop or similar. That or pop the sheath off in the pocket with your thumb. For me the most convenient FB carry method is sideways on the front of my belt. I can draw it, cut what I need to cut, then resheath it easily one handed in the dark. Based on the reaction to the Bow River, I'm guessing price point is a big factor. I've been looking for an EDC fixed blade lately. After tons of looking I finally remembered that mules were an option. Now I'm just deciding on pd1 or a11. I think if they marketed/reintroduced the mule in a complete package, made some handle refinements, and still offered it in a few different interesting steels, it would sell better. I think it can be a bit confusing or intimidating for newcomers, and it's easily forgotten about. And it's unavailable on bladehq/knifecenter etc. I anticipate it being a fantastic knife. 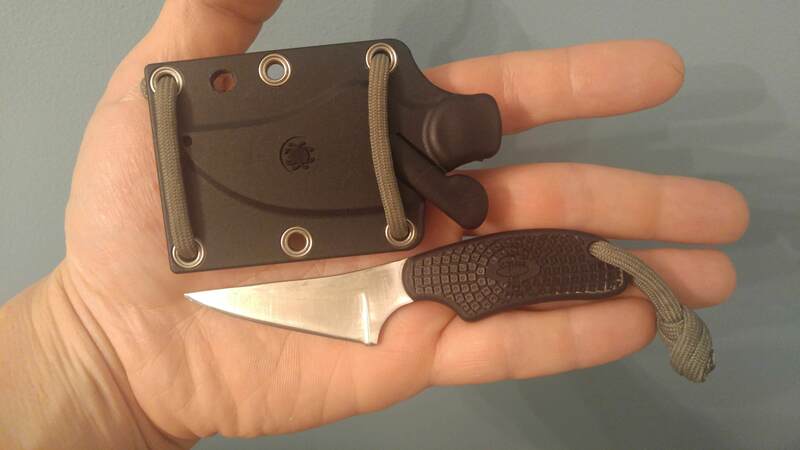 I want a Mule for some time,but i don't want to slap on it cheap handles,and quality custom ones are more expensive than the knife. I'll be all over a Mule with nice micarta or wood scales,and a leather,horinzontal sheet in the 150$ range. Mules are great but I really want a fixed military in cruwear. also a ro2 in a better steel. I think the upcoming bowies look great, but I don't need one. The s90v Wilson's are great too. Gotta agree. The unnecessary hole and the prices. I've been adding all sorts of fixed blades (much slower then folders) to my collection . Large choppers to small horizontal carry EDC blades....and everything in between. I've picked up two mules (20CV and A11) with Halpern scales, Street Beat, and Junction ....all which I absolutely love. I'm on the pre order list for the Province (which is priced appropriate IMO) and would love to get the Bradley Bowie eventually(maybe when it's discontinued or exchange). How does Spyderco justify the price of the Zoomer ? Especially when Bradford, Bark River, and LionSteel have competitive knives with similar (or better) materials! That's not even touching on the custom knife market ...which offers unique quality blades at similar prices to the Zoomer! Am I wrong? Please educate me and set me straight ...as I'm still new (13 months in) to this great hobby. I love Spyderco knives!, Actually addicted to them in reality ! But I can't justify a lot of their high end fixed blades.... that SEEM to be way over market. I would love for Spyderco to make more knives for EDC horizontal carry like the street beat in different steels and handle materials. The different blade shapes, steels, and handle materials of the Guardian 3 ...but with the spyderco flare would be awesome. Guardian 3 is pretty hard to beat. It's my preferred fixed EDC. I'm not actually sure that Spyderco could compete with it. The Street Beat works for horizontal carry. You can use the included G clip or use paracord loops like in my Ark photo. I'd go with the latter...using a G clip for horizontal carry, they can dig into my torso when I sit down. That's why I also prefer taco style sheaths for a more minimal height. I've seen a ton of Guardian 3's posted on other knife forums lately. I handled one....the choil handle design isn't my thing. I think the Zoomer looks really nice, but as soon as I saw the price I lost interest. Even if I wait for it to be discontinued and sell for half price.....that's still about double what I'd be looking at for a similar sized knife in 3V & Micarta. Same story with the Temperance 2. It's a really, really nice knife....but it's twice what I paid for a custom with similar features in a steel I prefer for outdoors use.